A New York-based collector has converted a vast former salt warehouse in Ibiza into an 8,000 sq. ft gallery, which opens this week on the Balearic island. La Nave has been founded by Lio Malca, who also runs a Modern and contemporary art gallery in Manhattan. The opening show is dedicated to the high-profile Brooklyn-based artist Kaws; it includes a 7m-high sculpture, entitled Clean Slate (2014), and six paintings, which are all owned by Malca. “There will be a combination of shows at La Nave. In the main space, we’ll show works fr om my collection, as well as works fr om other private collections—all museum-quality—and occasionally there will be commercial exhibitions,” Malca says. Artists represented in Malca’s family collection include George Condo, Keith Haring, Vik Muniz and Nobuyoshi Araki. La Nave is located on the south-east coast of Ibiza, which is better known for its package holidays and clubbing scene. “Ibiza has been welcoming people from all over the world, including international art collectors,” says Malca, who has funded the renovation project. He has also secured sponsorship from companies such as AirEuropa. The billionaire Guy Laliberté, founder of Cirque du Soleil, also runs an exhibition venue on Ibiza called Lune Rouge. This is hosting a Takashi Murakami show (the exhibition, which runs across four sites, was co-organised with the Los Angeles gallery Blum & Poe; until 26 September). Meanwhile, the Madrid-based contemporary art gallery Parra & Romero plans to open a small-scale sculpture park on Ibiza. 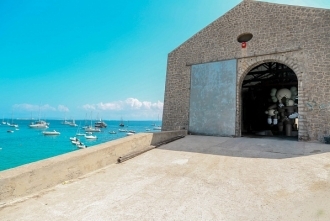 For the past three years, the gallery has shown works by artists such as Robert Barry and Lawrence Weiner in its Ibizan space, which is housed in a former farm building in the centre of the island. The new park, located alongside the gallery, will launch this winter with works on show by New York-born Barry and the Mexican artist Stefan Brüggemann. Next year, Guillermo Romero Parra, the gallery founder, aims to host a series of seminars at the gallery that will “contextualise the avant-garde history of the island”.